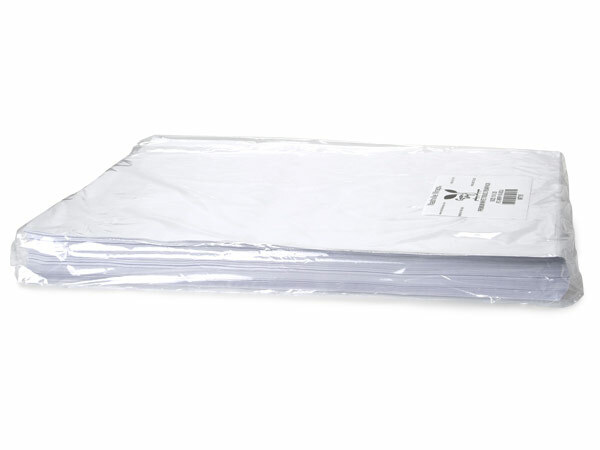 White 20x30" buffered archival tissue comes packed in 480 sheet packs. Buffered 12# Tissue paper is made from recycled bleached materials with no groundwood or unbleached pulp. It also has an alkaline reserve of at least 3% calcium carbonate as a PH Buffer. The buffer will protect against acids that are not there initially, but migrate or build up over time. The PH of this grade is 8.5-9, as is standard for buffered wrapping tissue. This grade has also passed a Photographic Activity Test and the TAPPI T 444 test for silver tarnishing by paper and board, so it is safe to use on photographs, important documents, jewelry, and other metals. Read about the different applications for archival tissue here! Archival White Tissue is available in either buffered or unbuffered anti-tarnishing grades and each has specific uses. These wrapping tissues are primarily used for preservation and storage of materials that are sensitive to the chemical environment around them.